I talked a little bit about designing the Ulon Dosi females in the Commentary for The Big Snow Job #4, Page 6. 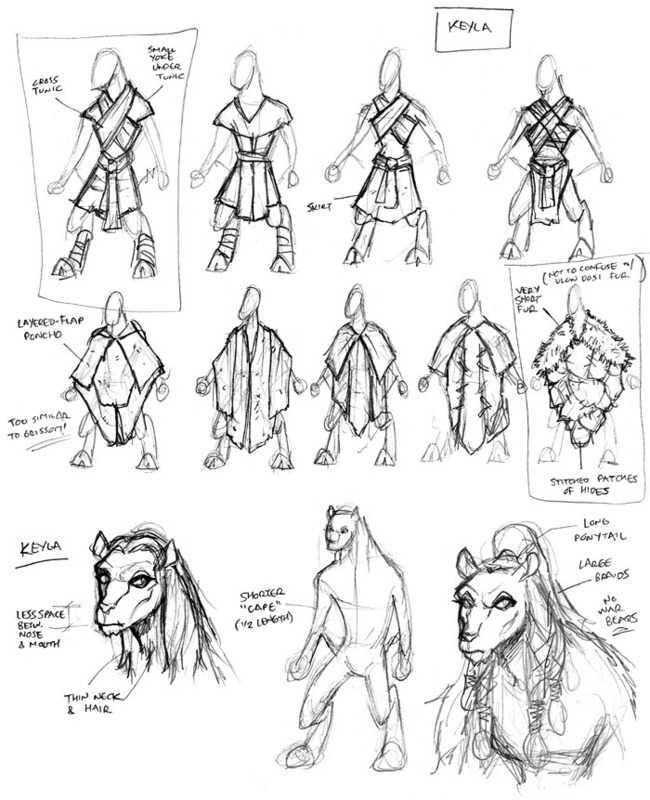 Here we have the sketches I did to flesh out Keyla, especially her outfit. Obviously I wanted to make her clothing similar in “language” to the other Ulon Dosi, but it needed to be a slightly more feminine version of the standard hide tunics. And as I mentioned in the other Commentary, the yellow color of her outfit was to make it a bit “softer” visually than the tan and natural tones of the other Ulon Dosi. Keyla’s cloak also needed to stand out, since in many of her earlier panels, only a small portion of her would be showing and I needed the look to be, more or less, instantly and easily recognizable. I liked the patchwork enough that it eventually made it into Clem’s outfit as well. As for the white fuzzy fur, I also incorporated that into Goshen’s look to visually connect them since they’re related as father and daughter.